A few years ago I was walking around Kingston’s Sydenham Ward and heard the sound of a fountain coming from a garden courtyard – I tried to peek past the flowering vines and privacy fence but could never get a good look inside. This was the title garden at the Secret Garden Inn – ever since, I have always wanted to stay there to discover the treasures that lay hidden behind that fence. This past week I finally received my wish and stayed at the B&B for a relaxing vacation in the city. Kathy, the Innkeeper, greeted me at the front door when I arrived and showed me around the house. I was provided with a turn-of-the-century key for the original lock for my door. I have to admit I got a kick out of turning the wizardly key in the lock. 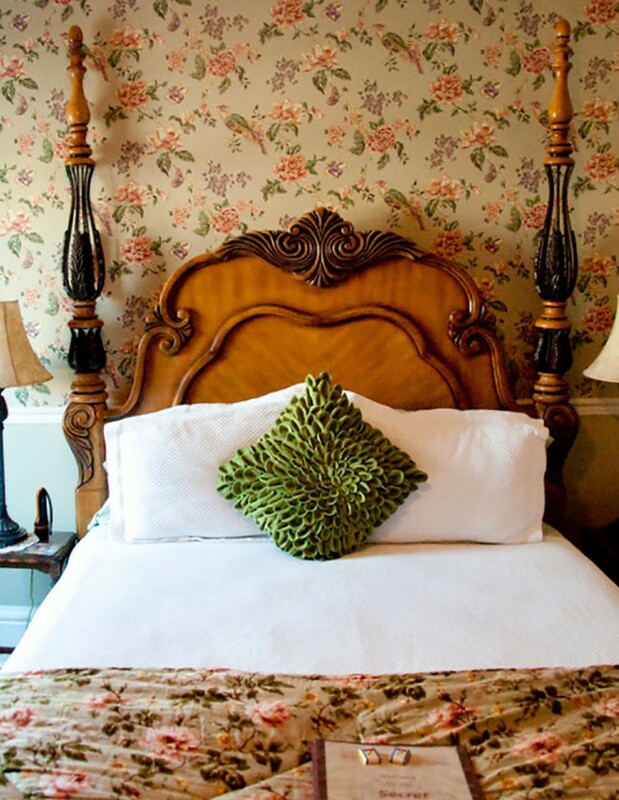 The Secret Garden Inn (73 Sydenham Street) is located in the historic residential area between Queen’s University campus and downtown. This makes it an excellent home base for local festivals or conferences. I enjoyed simply wandering the streets around the Inn and enjoying the unique architecture. If you’re like me and enjoy a bit of history the City of Kingston has published a self-guided walking tour of William Street. 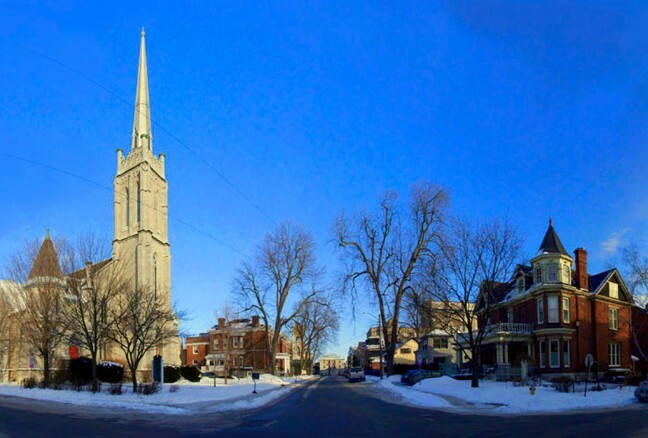 The downtown area is less than a ten minute walk and is the centre for Kingston’s wide selection of local restaurants. I recommend taking a walk to City Hall, taking in some skating at the Square, and ending off the night with some locally-sourced tapas and Prince Edward County wines at Tango Nuevo (331 King Street). The Secret Garden Inn across from Sydenham United Church at William and Sydenham Street. 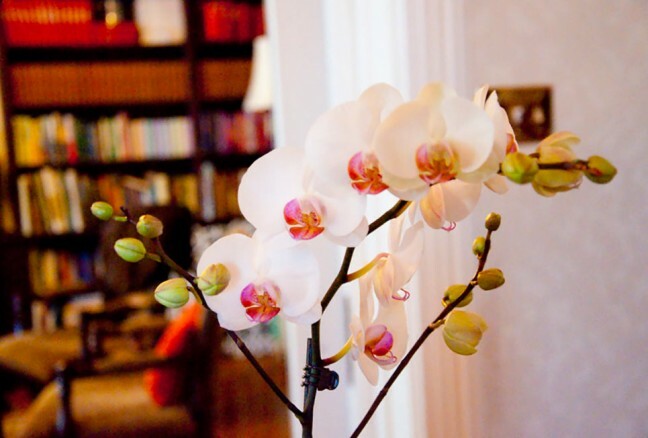 The orchid greeting you at the front hall at the Secret Garden Inn. The Secret Garden Room at the Secret Garden Inn. Each one of the rooms at the Secret Garden is uniquely decorated. My room was outfitted with a four-poster bed and a claw-foot soaker tub in addition to seating for three. I got the chance to get a tour of the other rooms and they are quite lovely as well. My favourite was the Secret Garden Room since it has its own private patio in the summer. My bathtub was outfitted with designer bath salts to enjoy in the huge tub. The room was also stocked with wine glasses and a corkscrew if you have a reason to celebrate – or you just want to relax with a glass of wine. After a relaxing night in the Victoria Rose room I woke up to the smell of breakfast being prepared downstairs. I’m a bit of a caffeine addict so I snuck downstairs before breakfast for a coffee – it was definitely not a commercial blend and was very fresh. Kathy brought out a peach pancake along with a yogurt parfait and sausage for breakfast. The peach pancake was not really what I pictured – it was tall and dense and had a fresh peach slice baked-in. It was very filling and even tastier topped with genuine maple syrup from Perth. 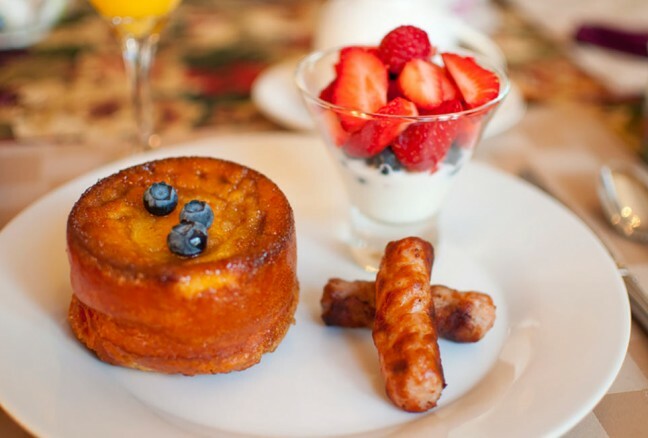 Breakfast – a peach pancake, lightly herbed sausage and fresh strawberries and yogurt. The turret on the main floor of the Secret Garden Inn. 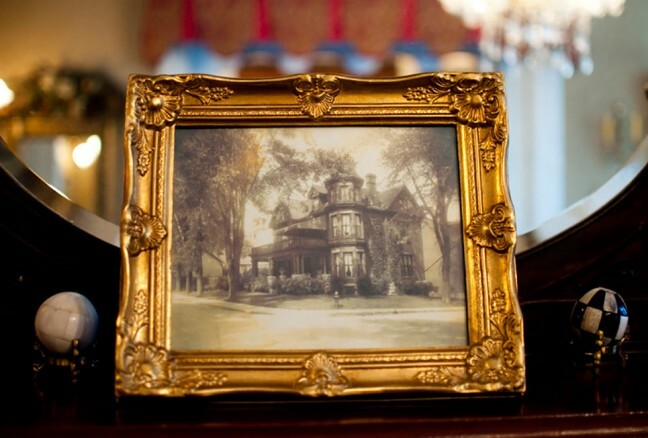 Since the Secret Garden Inn only has seven rooms it was easy to chat with the other guests over breakfast. As we got to chatting it was clear that the guests chose the Secret Garden for the sense of community and hospitality. 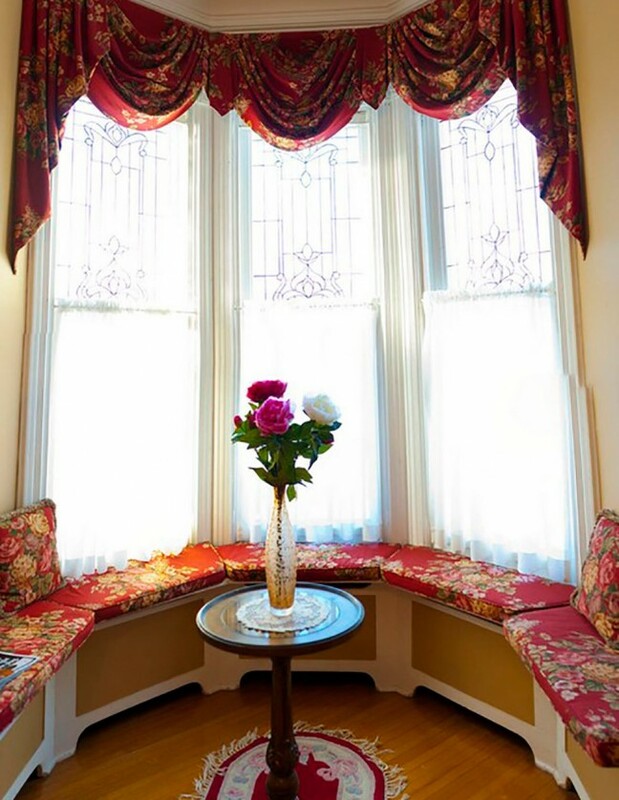 Staying at the Secret Garden is more like staying with a friend – it feels like home. In the summer Kathy tells me most guests enjoy a glass of wine on the patio or in the secret garden itself, which wraps around the house. Since the garden was blanketed in fresh snow I didn’t get to see the Koi Pond in action – I guess I’ll have to come back in the summer! 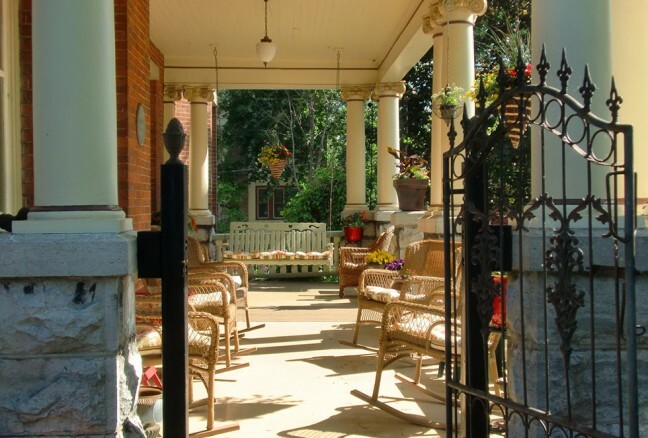 The beautiful porch in warmer months.